Externality as a case of cost in NYC water described. New York is among the few American cities enjoying high-quality unfiltered drinking water, most of it from reservoirs in the Catskill-Delaware watershed west of the Hudson River. Keeping things that way means protecting the streams feeding the reservoirs from contamination, which in turn means restraining commercial and residential development. A clean watershed will also save the city $6 billion - the cost of building a filtration plant, which the federal government will require if New York cannot guarantee the purity of its upstate reservoirs. In recent years, the city and the upstate communities have together done a solid job of protecting the watershed, largely as a result of a 1997 agreement under which the communities pledged to avoid large-scale development in exchange for various forms of economic assistance from the city. In addition, the city agreed to buy land from willing sellers to serve as buffer zones around the reservoirs - an important step because the biggest threat to clean water is polluted runoff from farms, housing developments, roads and strip malls. 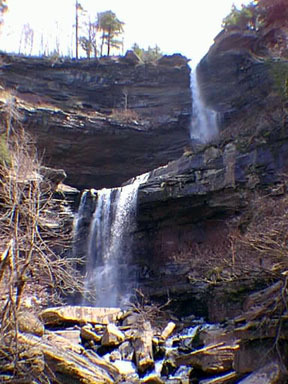 Kaaterskill Falls (seen above) is the highest waterfall in the state of New York . The 1997 agreement now faces its biggest test. An upstate developer, Dean Gitter, is seeking state and city permission to build a five-star resort on opposite sides of Belleayre Mountain, where the state maintains a ski center. Belleayre is 120 miles northwest of the city and within 20 miles of two major reservoirs; the most important is the Ashokan. Mr. Gitter is not thinking small: his 500-acre resort would include 400 hotel rooms, 5 restaurants, a conference center, 2 spas, 351 time-share apartments and 2 golf courses. Having lived in the Catskills for 34 years, Mr. Gitter is no interloper. He says that his design incorporates every possible safeguard, and that the project will generate more than 700 jobs in one of the state's poorest regions. Inevitably, however, a project of this size carries risks that extend beyond the boundaries of the project itself and over which Mr. Gitter may have little control. For instance, environmentalists fear that the project will not only destabilize the mountain's thin soil, sending polluted rainwater into streams feeding the Ashokan, but will inevitably invite secondary development, including - fatally, in their view - a widening of Route 28, the area's main artery. That, they say, would be the beginning of the end for New York's unfiltered water supply. Incredibly, the state's Department of Environmental Conservation had planned to close the public comment period on the project on Feb. 24 - hardly time to examine the 6,000-plus pages of an environmental impact statement that was made available for public inspection in early December. Under pressure, it has now agreed to extend the comment period until April 23. These months should be used wisely. However well-intentioned Mr. Gitter's motives, the sheer size of his project raises serious questions deserving the most serious examination. Nine laws that lie behind the concept of accounting for externalities. Thames as an example of a common cost due to externalities. Kaaterskill Falls is the highest waterfall in the state of New York. The falls are 260 feet high - ignoring the ledge breaking the falls 180 feet below the upper lip of the falls. The shelf breaking the falls represents the contact between the Manorkill Sandstone (Middle Devonian Hamilton Group) and the overlying sandstone and shale of the Late Devonian Oneonta Formation (Catskill or Genesee Group).